Having previously sold out at Ronnie Scott's in 2012, 2013 and 2014, this festive jazz show swings by The Apex on Wednesday 16 December. Fronted by acclaimed singer Joanna Eden ("UK's answer to Norah Jones and Diana Krall" – Time Out, "Seek her out" Michael Parkinson) and featuring the immaculate clarinet and saxophone of Mark Crooks (star of Proms favourites the John Wilson Orchestra) and the groovy sounds of the Chris Ingham Trio ("a first-class band" – Jazz Journal), Jazz at the Movies: a Swinging Christmas gathers jazzy holiday favourites as made famous by Ella, Eartha, Frank, Doris, Dean, Bing and a whole gang of cool celluloid cats and hip Hollywood chicks. An enchanting show rich with anecdote, wit, sophistication and swing, it was described by one audience member as "pure joy". "Movie songs like these provide good material for the best jazz singers. Joanna Eden and her first-class band had a ball with them ... and so did the audience!" – Jazz Journal. With material ranging from Bond to Bacharach, Dankworth to Disney, Porter to Pinter, Jazz At The Movies is an enchanting, entertaining show, rich with anecdote, sophistication and swing. Jazz at the Movies is at The Apex on Wednesday 16 December at 8pm. 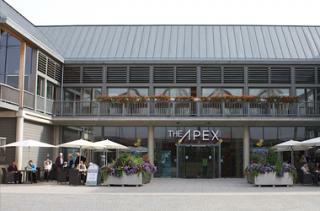 Tickets are £14, call the Box Office on 01284 758000, or visit www.theapex.co.uk for more information, or to book.